Tough molded, flexible plastic material. Will not rust or corrode. Allows bracket and license plate ..
Zinc plated steel slotted for universal mounting. Size: 8-1/2" x 2-3/4"..
1/4-20 license plate bolt-4/c Card: 4Size: 1/4-20 x 5/8"Box: 10 (Cd.).. 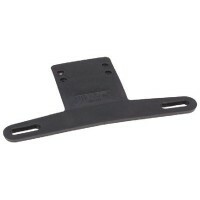 Angled license plate bracket, made of rust proof black polymer. For use with stud mount license ligh..
Molded of high impact, non-corrosive polypropylene or zinc plated steel. Mounts easily to Wesbar tai..